Shapoorji Pallonji Mumbai Dream: Beautiful residential spaces that redefines luxury and comfort. Mulund is a suburb in Central Mumbai that have gone through a massive change over the years and serves as a brilliant residential location today. Once a little village, Mulund is now a suburb that offers an enhanced living experience in Mumbai. This location offers excellent connectivity to other suburbs in Mumbai through its wide range of transaction facilities, fabulous modern-day infrastructure and property rates that are cheaper when compared to other locations. When it comes down to social infrastructure, Mulund offers it in plenty. From reputed schools and colleges, to malls, shopping centres, multiplexes, cafes, restaurants, hospitals, banks, ATMs, supermarkets, retail outlets, clubs, lounges and more. The overall growth in Mulund has driven a number of home buyers as well as investors to this location. Needless to say, a number of real estate companies have also diverted their attention to Mulund today. You can get incredible property in Mulund below 1 crore, provided you look at the right places. Now is the right time to purchase property in Mulund as this suburb goes through constant development and will surely give you better returns in the days to come. While the residential options are many, choosing the right project is very important in order to get total value for every rupee spent. 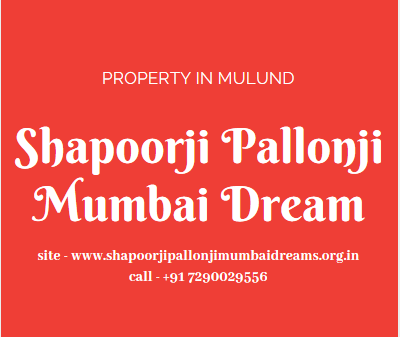 Shapoorji Pallonji Mumbai Dream Mulund is a great high-rise residential project by Shapoorji Pallonji that you should definitely consider when looking out for apartments in Mulund.This development sits on a bed of 3 acres of land and contains high-rise towers that offer 1 BHK flat in Shapoorji Pallonji Mumbai Dreams Mulund, 2BHK as well as 3BHK apartments that are carefully designed to meet every requirement and taste. The apartment carpet areas start at 402 sq. ft. and go up to 786 sq. ft. This high-rise offers a total of 1700 apartments to choose from. This high-rise development offers world-class internal and external amenities for a modern-day lifestyle that is truly commendable. The apartments are high on space, provide good air flow natural lighting and contain high-end fittings and fixtures, vitrified flooring, modular kitchens with high-quality counters and multiple provisions, wide balconies and windows, safety features and more. The external amenities at this residential development are crafted to offer the highest level of luxury and comfort. They include a clubhouse, meditation room, multiple sports facilities and a play-are for kids, crèche, art corner, Wi-Fi working lounge, skating rink, box cricket and rock climbing activity, multipurpose hall, board game zone, jogging track, outdoor library, book café, picnic area, party deck, power back-up, car parking facility, vehicular drop-off, swift elevators, landscape garden, dedicated area for senior citizens, wide open greens and high-end security with video surveillance. Starting at an impressive price of Rs.92 lakhs and going up to Rs.1.67 Cr. the residential spaces at this high-rise developmentare reasonable and definitely worth a buy.This development also offers multiple payment plans along with home loan facilities, NRI services and more for a simplified buy. 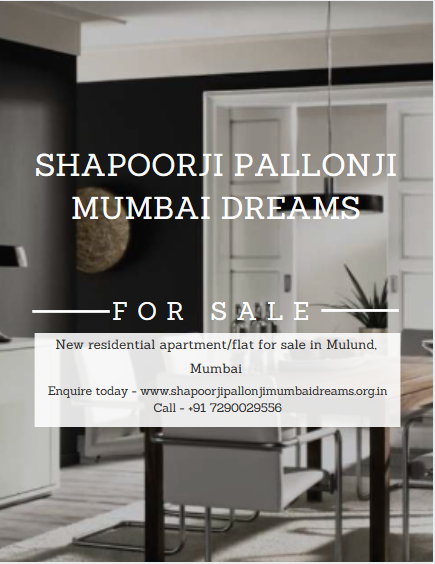 Without a doubt, this latest development by Shapoorji Pallonji for the most luxurious 1BHK, 2BHK and 3 BHK flats in Mulund.